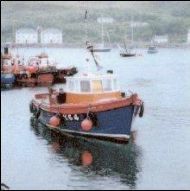 Boat trips from Mallaig on board the Grimsay Isle. A traditional wooden clinker built fishing boat. Experienced Hebridean skipper who has a wealth of local knowledge, witty sense of humour and speaks fluent English and Gaelic. Toilet facilities are available onboard. Fishing trips and ferry service at competitive prices. Due to the construction of the vessel and harbour there is unfortunately no disabled access.